Carpets are great looking accessory to every space and every home. Well, when it comes to homes they really do have aesthetical purpose and value for a while and then the same quite often gets compromised and sacrificed to living habits. 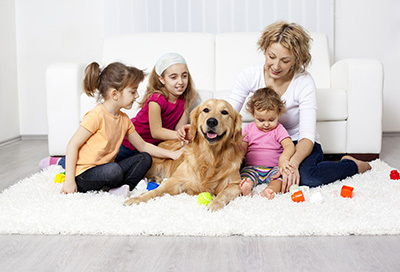 The biggest threats to carpets’ beauty are children, visitors and pets. This apparently strange looking group is all it takes to ruin amazingly looking carpet at record times. It is not a challenge, but unfortunate and quite often unavoidable reality. If you are wondering how your visitors can negatively impact your carpets looks, just keep reading and we will reveal it to you in no time. They can do this in apparently simple and extremely effortless way. The thing is that when you allow your visitors to enter your home in their shoes you are helping the destruction of your own carpets. People step outside all over and then they bring all the dirt from the outside into your home. If you are wondering what children have to do with it then it is quite obvious you do not have children. Children act extremely fast and they may destroy your carpet in less than twenty minutes. Give them access to right kind of tools like for example colors, dyes and similar and look at them go. Pets have almost the same power as the children. If you are lucky your pet will endanger your carpet’s looks by covering it only and exclusively with excessive hair. That is if you are luck, if you are less fortunate then you can expect everything. The best way to cope with all the above mentioned is with the professional help. Find reliable carpet cleaning service providers and make sure your carpet always look impeccable!